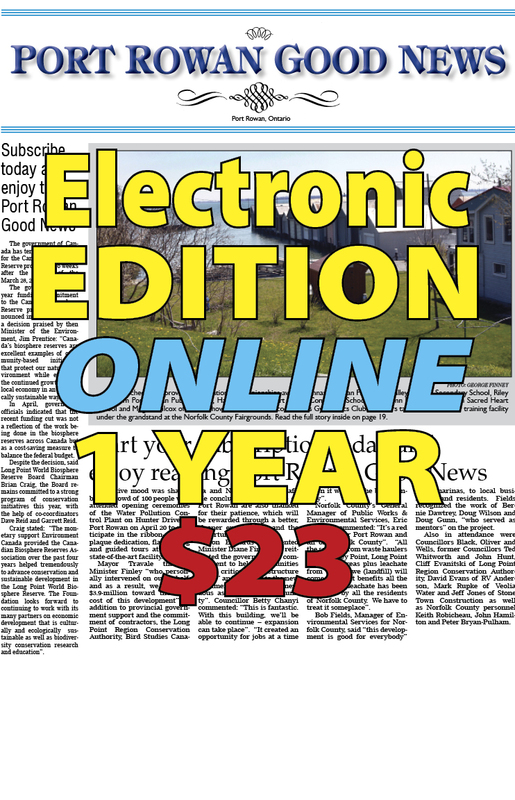 One year online subscription to the Port Rowan Good News. Access and download from anyhere, anytime to get your local news when you need it. Once purchased, you can access to a special subscribers page on our site when logged in. There you can download the current edition as well as a few back issues. To read each months issue. 1) Log in to www.portrowangoodnews.com with your registered user name and password. 2) Click on the special subscribers tab near the top of our page. 3) Click on the download link for the edition you want to read and save the file to your computer or tablet for offline viewing. One year online subscription to the Port Rowan Good News. Access and download from anywhere, anytime to get your local news when you need it. Take the PDF edition with you on your laptop, tablet or smart-phone and read wherever and whenever you want. Once purchased, you can access to a special subscribers page on our site when logged in. There you can download the current edition as well as a few back issues.